This year's Banquet will be on Saturday, February 16th. Funds this year will contribute to continuing our improvements to the Range to maintain our certification. 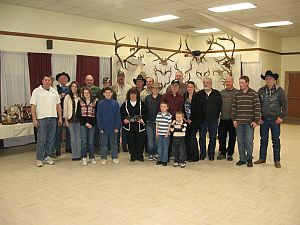 Our ANNUAL WILD GAME DINNER, FUND-RAISER AND TROPHY AWARDS. Besides having fun, our goals are to recognize the hunting and fishing achievements of members, young and old and to raise money for the year’s projects. The beautifully catered meal features salmon and a variety of game meats donated by successful members (often including deer, elk, moose, cougar, etc.) and an exotic meat. Beef is of course also on the menu. Raffles, door prizes, card draws, bucket draws and a silent auction make for a lively and entertaining evening. Each year lucky participants walk out with chainsaws, bows, firearms, or a variety of smaller items made possible by the wonderful support we receive from community businesses.